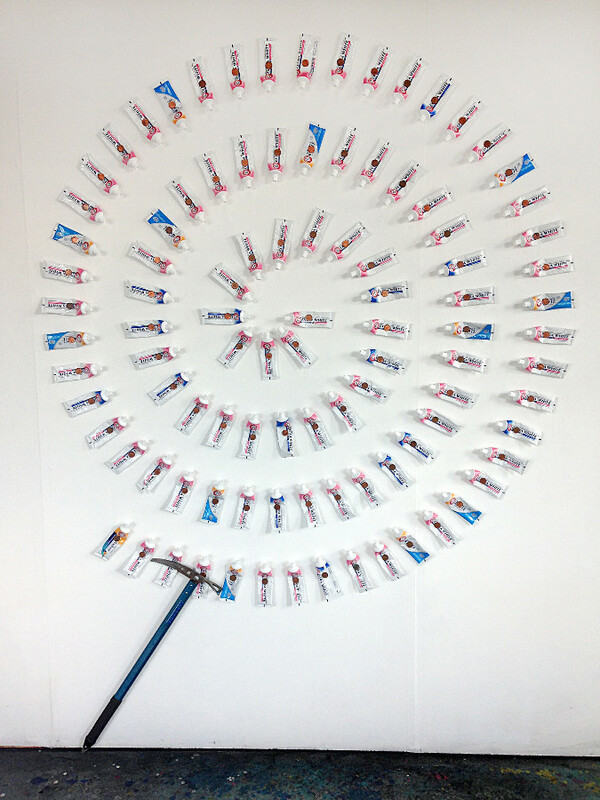 The Snow-White Rose of Paradise (2015, 170 x 230 cm) is made with partly empty toothpaste tubes with pennies and magnets attached. A part of the content has been squeezed out before the assembly of the relief assemblage, with almost surgical care. Used -yet pristine outside. That betrays an intention carefully planned and executed, a high degree of artist’s control. More than 50 % of each toothpaste tube is visible thus fitting the definition of a High Relief in sculpture. This is subverted by the plane, in this case the wall, being only slightly lower that the toothpastes making it fit another definition, that of a Low Relief, a sort of bas-relief. The slippage, skidding, of categories and meanings, play also with details: the manufacturer’s name: Arm and Hammer – easily skids into Sickle and Hammer/Hammer and Sickle, a symbol of worker/peasant alliance, of salvation/paradise ubiquitous during the 20th C across the globe. The added ice axe nonchalantly evokes that arm is needed to secure a position on a slippery surface – the insecure paradise. Stuck on pennies do not offer any assurance of the Snow-White Rose as a path reaching the paradise: of small exchange value they still manifest control by money. All is held by magnets – power of nature that people learned to manipulate. William Morris’s expectation that in 2102 humans will not use nature for ends exterior to it comes to mind almost with a touch of sarcasm. Ever receding horizons…. Karl Gerstner, Color Spiral Icon x65b, 2008. 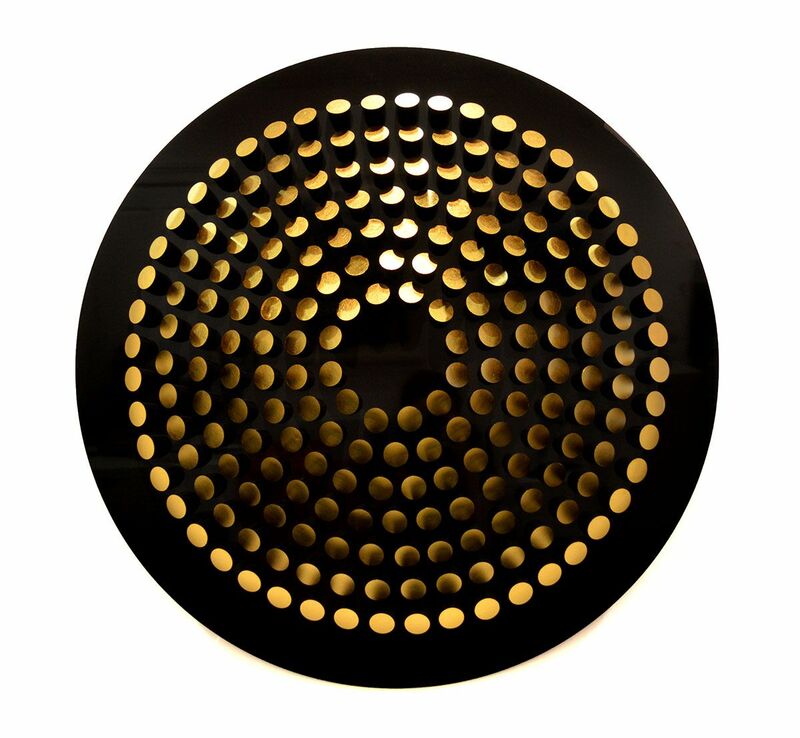 Acrylic on aluminum, diameter 41 in. (104 cm). Collection of Esther Grether, Basel, Switzerland. Gerstner’s abstraction does not cross from art to socio-political issues facing mankind. Darke’s use of “lesser” objects and evocative title – embedded the Snow-White Rose of Paradise in the dense belief that the current work of art is merely life itself moving moving toward the betterment of mankind – and failing. Its beauty liberates the familiar (toothpaste) into a metaphoric net woven by recalling K Marx, V I Lenin and Rosa Luxembourg as well as the Snow-White waiting to be woken up. No secure answer to a question whether the spiral is ascending or descending… Fermi paradox. Or – is it born by our own inadequacies – leaving the universe out of it? Should I recall here Seneca’s belief that the world is doomed for cyclical destructions due to natural forces? He foresaw waters salt and fresh to overwhelm the land. Will an injured hill enact revenge? The ice axe seems pointing to a (past?) future ice age replacing the current global warming. In theory – both were identified by the science as possible “final solution”. The spiral of manufacture and use of goods has a latent force to turn – reminiscent of Karl Marx’s ” locomotive of history”. The relaxed ice axe waits, as if, to be grabbed “for the emergency break” of Walter Benjamin. The spiral’s freedom/ambiguity becomes visible in comparison to concentric circles. The spiral promises to go on, grow bigger… it is inviolable by additions – sharing its relaxed boundaries with the classical view of the ocean – which bounded the known world, the inhabited Earth, oikoumene, with yawning voids around it. The spiral is a conscious field – reaching on the possible thresholds, evoking structure visible at present and remembered from previous encounters. Such synaptically mediated interactions forge an instant assembly as well as a winner-takes-all competition. Your conscious field may stabilise an aesthetic experience very different from mine, a difference that is not only welcome but also defining how we each are. The Snow-White Rose of Paradise may be ironic – it is also sincerely beautiful. This entry was posted in essay and tagged coins, Colin Darke, ice axe, Karl Gerstner, magnets, oikoumene, Peter Monaghan, Seneca, spiral, Suki Tea 2015 art prize, toothpaste, W Morris. Bookmark the permalink.